If you've been enjoying my ancient wisdom posts every day on Facebook and have either an Alexa-enabled device or just the Alexa skill on your smartphone, You can now listen to even more quotes in my FREE educational Alexa skill "Ancient Wisdom" that was just published this morning! I compiled over 100 quotes from ancient Greek and Roman sources that were selected because I thought they provide guidance for issues we face today. I hope to add sources from ancient Egypt, ancient Persia, and ancient China as time permits - after all, I am retired! at the Capitoline Museum in Rome. For just as children tremble and fear all In the viewless dark, so even we at times, dread in the light, so many things that be, no whit more fearsome, than what children feign, shuddering, will be upon them in the dark. This terror then, this darkness of the mind, not sunrise with its flaring spokes of light, nor glittering arrows of morning can disperse, but only Nature's aspect and her law. Lucretius. The Nature of Things. Book 6. Although the current Alexa app is designed for voice-only devices, I hope to eventually modify it for the Echo Show and Echo Spot and include the images as well. 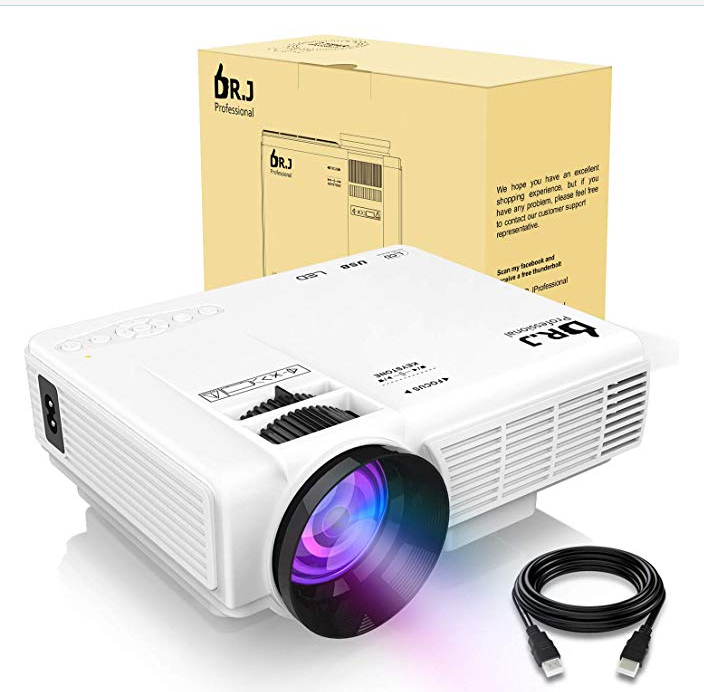 If some of you, like me, are asked to present information periodically that includes images and video and no longer have access to institutional multimedia equipment, you might be interested in this 3 pound Dr. J micro-projector measuring just 7.8 x 2.7 x 6 inches that is capable of producing projected output of 170 inches (diagonally). In September, I will be attending my 50-year class reunion and offered to produce some music videos of my classmates working and having fun over the past 50 years as well as a salute to our class veterans. But the Historical Museum where we will be gathering owned no projection equipment. Since I'm retired, I also no longer have access to a university projector. It was a bit of a dilemma until I saw this unit advertised as an Amazon Lightning deal for only $60. (It is regularly priced at $98.99 - still a bargain!) It was very positively reviewed, although for the price, I quite honestly, wasn't expecting a lot. When the projector arrived, though, I was very pleasantly surprised. The unit is solidly built and comes with a remote as well as having adjustment controls on the projector itself. I had copied my videos to a flash drive and inserted it into the USB port then turned on the projector and selected USB as my video source using the setup menu. Then I navigated through the flash drive folders to the folder containing my videos and selected the one I wished to play. Pressing the source button again opened the video in full screen mode and played all videos in the selected folder. I was quite pleased with the color reproduction and thought the sharpness was also quite good as well. The unit has built-in speakers, a big plus for such a compact unit, and they put out a decent amount of sound. If you need more volume for a larger room, you can use the included RCA cable to connect external speakers. Quite honestly, I was totally amazed at the quality of the output for such a small price. When I was an education technologist before I retired ten years ago I had to spend over a thousand dollars to get the results this LED micro-projector produces. In short, this little gem offers great portability, is easy to set up and adjust, and has very good sharpness and color reproduction for a terrific price! (No, I don't work for this company or receive any commissions for publicizing it.) I just might go forth and produce more presentations on the Roman Empire for local groups now that I have a way to share them. After all, if the SAT advisory board follows through with the proposal to eliminate teaching history before the mid-1400s in U.S. AP courses, someone needs to do it!! The legal and social constructs of the classical world were used to form the foundation on which our republic was built! Note: The projector shipped with an HDMI cable which is great for those with a newer laptop or other HDMI-compatible devices. However, if you are using an older laptop as your content source you will need your own VGA cable and audio patch cable to connect your laptop's VGA port and headphone jack to the projector's VGA port and AV jack as they are not provided. Unless your files require software on your laptop or you are demonstrating software, though, I recommend copying your images or videos to a USB flash drive and eliminate the hassle of connecting all the cables for laptop projection. This unit is optimized for video output and is not recommended for text-heavy Powerpoint presentations. However, I could still read projected text with the unit properly focused. Instead, I use a slideshow program called ProShow Gold by Photodex to combine my images with a soundtrack, add transitions, and output a video file in my desired file format. 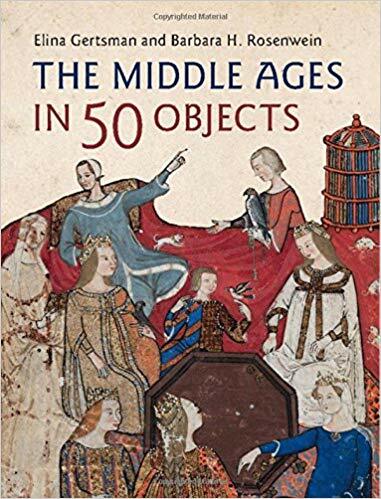 Normally, I review books focused on the ancient world but I received an email from Cambridge University Press asking if I would be interested in receiving a review copy of their new release "The Middle Ages in 50 objects." Even though the Middle Ages is not the period of my personal research, I still enjoy examining art and artifacts from the Middle Ages when I photograph the permanent collections of of the museums I visit, so I agreed to give it my attention. As promised, the book was lavishly illustrated with full page color photos of the artifacts selected for inclusion. I was surprised that all of the objects came from a single museum, the Cleveland Museum of Art, though. Most world-class museums have galleries of medieval art so I was not expecting a single museum not devoted to that historical period, to have the breadth needed to encompass an entire age. But Professor Elina Gertsman of Case Western Reserve University and her co-author, Professor Barbara Rosenwein of Loyola University Chicago, have certainly selected objects that are representative of their four focus areas, The Holy and the Faithful, The Sinful and the Spectral, Daily Life and Its Fictions, and Death and Its Aftermath. Most objects are Christian-themed, but several artifacts from Islamic regions are also included. I was particularly surprised to find a sculpture dated as early as 280-290 CE to be the first object discussed, though. I usually consider the Middle Ages a period from the fifth to fifteenth centuries CE, after the fall of the Western Roman Empire and lasting into the early Renaissance. But, as a scholar of the ancient period, I was, of course, anxious to read what these distinguished art historians had to say about the piece. Jonah Cast Up Roman 280-290 CE. Courtesy of the Cleveland Museum of Art. The piece, entitled Jonah Cast Up, was a bit baffling to me. Most of us are quite familiar with the tale of Jonah being swallowed by a a huge fish (New International version, King James version) or dag gadol - great fish (Hebrew). But here, the "fish" has the head and forepaws of a wolf, typically symbolic of the Roman Empire. 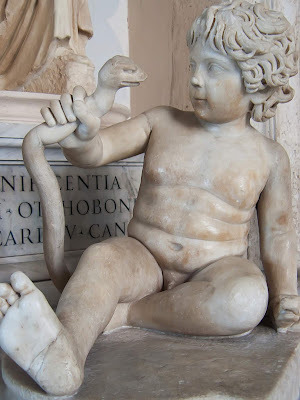 Furthermore, the male figure has the hair style and beard often seen in Roman art depicting Jupiter. The authors, too, recognized the resemblance of the Jonah figure to Zeus (Jupiter in the Roman pantheon). "A strong muscular man with an abundant beard and wild curly hair, Jonah dives out from the jaws of the beast, arms up, the movement of his torso echoing the direction of the sea creature's pricked up ears and scrunched snout. The broad-shouldered Jonah, with his copious curls and robust arms, is reminiscent of images of Zeus, the Greek god of Thunder and the ruler of Olympus." But they say nothing about the symbolism of the wolf other than to observe that the great fish of the Jonah story has sometimes been interpreted as a sea monster (in later Greek translations of the scriptures). I thought, perhaps, the archaeological context could provide additional insight. The authors point to collateral finds as possible evidence of a patron with Christian leanings. "This sculpture seems to have formed part of an ensemble. It was supposedly found buried in a very large jar alongside six paired portrait busts, an image of Christ the Good Shepherd, and three other representations of Jonah in prayer, under the shade plant, and being swallowed by the sea monster. The patrons therefore appear to have had Christian leanings." 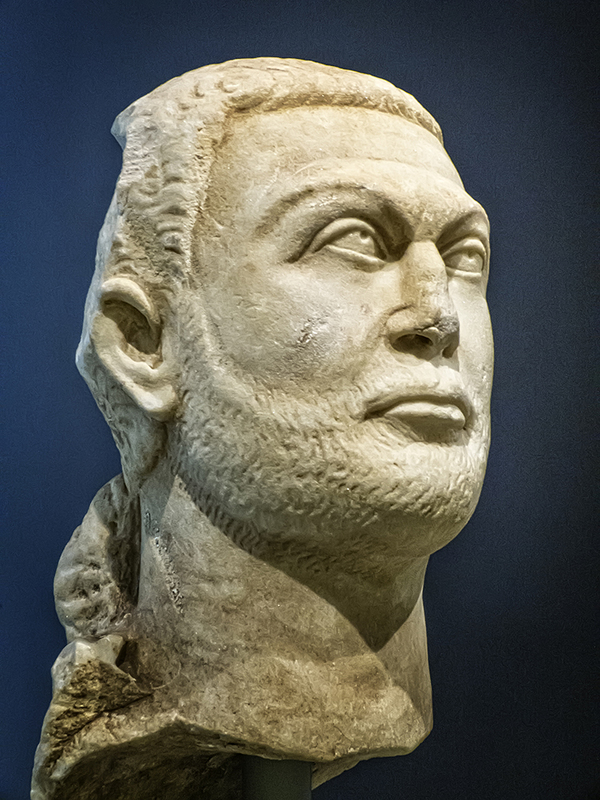 The dating appears to be tentative and the authors speculate whether it was produced a little later than the date given, perhaps during Diocletian's persecution of Christian believers in 302 CE. "Soldiers were ordered to sacrifice to the Roman gods or face discharge; Christian churches were destroyed; books of scripture were confiscated and burned; and Christians were stripped of their rank if they did not conform, making them liable to torture or execution. Whether carved before the Great Persecution or at some point during it, the marble image of the rebellious Jonah - not only saved from drowning but also finding himself cast safely ashore - must have been exceptionally reassuring." I would offer a slightly different interpretation as another possibility. I think the sculpture could have been produced a little later still, during the reign of Constantius II. 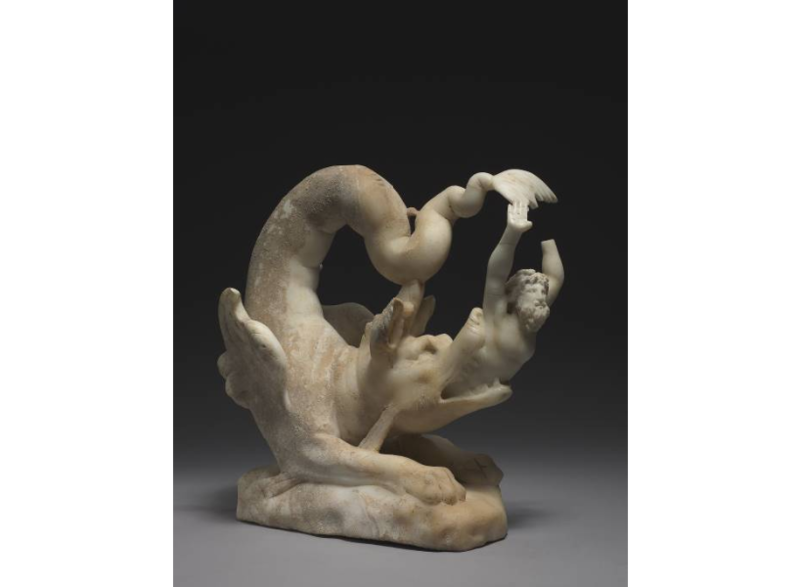 Although seemingly an image representing the Jonah story, I think it could have been carved to represent the expulsion of paganism from the Roman Empire itself. That would account for the human figure's resemblance to Zeus (Jupiter) and for the wolf's head on the sea monster's body - still probably reassuring to a Christian-leaning patron who may have suffered during the Great Persecution. I definitely agree with the author's summary conclusion, however. "Jonah Cast Up stands as a perfect witness to the cultural and religious complexity of the late third [and early fourth] century." I also found a gilt-silver arm reliquary of the Apostles, circa 1190 CE, from lower Saxony interesting too. Although I view the veneration of bits of human corpses to be a macabre practice, I have admired beautiful reliquaries, strictly from an artistic perspective, at a number of museums I have visited. As an ancient scholar, though, the thing I found really intriguing was the authors' observation that often reliquaries do not house the body part they represent, although this one did. It seems deception has plagued religions for thousands of years as I have read that ancient Egyptian votive mummies depicting various animals rarely contain the animal they represent either. I found the background information on a 14th century French ivory mirror case depicting a couple playing chess quite eye-opening. In fact, the authors' description of some of the symbolism represented by this particular mirror and chess as a metaphor for courtship made me blush! "Such mirrors were popular in French and German wealthy households, surviving in large numbers. The subjects carved on their cases were almost always secular, some featuring the God of Love, others the Castle of Love Under attack still other scenes of courtship and narratives from romances. The game of chess, very popular in medieval literature, was particularly favored for mirrors, which were given as gifts and often formed part of a trousseau." I'll definitely have to keep my eye out for more of these little marvels in my museum travels! I found the authors' background information and symbolic interpretation of the selected artifacts in "The Middle Ages in 50 Objects" quite fascinating and highly recommend this text. 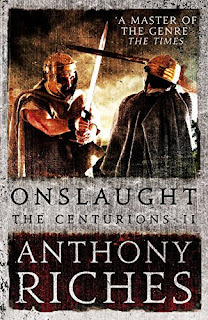 As I began listening to Anthony Riches' "Retribution" today, I realized I had not reviewed its prequel "Onslaught", the second in "The Centurions" series about the Batavian Revolt during the year of the Four Emperors, 69 CE. So, let's remedy that now. 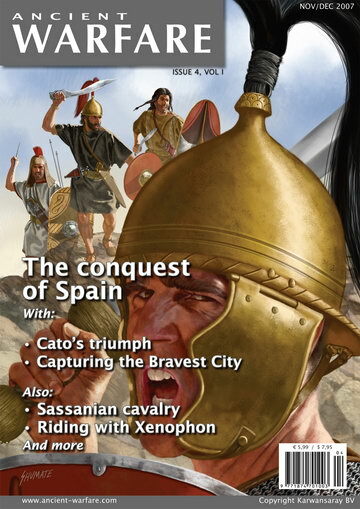 Toward the end of The Centurions Book 1, "Betrayal", a sizable portion of the Batavian cohorts has been sent south from Germania Inferior to fight the forces of Marcus Salvius Otho, a young Roman aristocrat who has instigated the assassination of the short-lived emperor Servius Sulpicius Galba and now claims the purple for himself. The legions guarding the Rhine frontier, who initially marched south to fight Galba, are unwilling to accept Otho either, since they declared their own commander Aulus Vitellius emperor before hearing of Otho's coup. Now they plan to enforce their will regardless of which man the weak Roman senate ordains. The forces clash violently at Cremona with Vitellius' forces victorious due in no small part to the ferocity of the Batavians. As a reward, Vitellius orders the Batavians to return to their homeland. But then word comes Titus Vespasianus, a general who has personally fought beside the Batavians in Britannia and even owes his life to them, has declared his intention to wrest control of the empire from Vitellius' tenuous grasp. So, Vitellius changes his mind about sending the Batavians home to their prince. This poses quite a dilemma for the Batavians as they have no real personal allegiance to Vitellius and they also know the Rhine legions he commands are determined to eliminate their prince Gaius Julius Civilis for his apparent collusion with Gaius Julius Vindex in an ill-fated revolt to support Galba a year earlier. Then, word leaks out that Vitellius plans to break up the Batavian cohorts and distribute them across his legions to blunt any threat they may present in the future. Meanwhile, Civilis meets with envoys from Vespasianus including Pliny the Elder, and agrees to begin a rebellion to distract Vitellius and prevent him from ordering the remaining Rhine legions south to meet Vespasian's forces. Historically, this may have occurred, but is not specifically stated in any ancient sources. Civilis knows it is a dangerous game he plays as Rome has always ruthlessly punished any tribal group who attempt to throw off the Roman yoke. How far can he really trust Vespasian or even his own countrymen knowing he, himself, does not go unchallenged for leadership? Much hinges on arrangements he has made with a long-time tribal opponent, Claudius Labeo. The plan is kept secret from even Civilis' closest kinsmen. 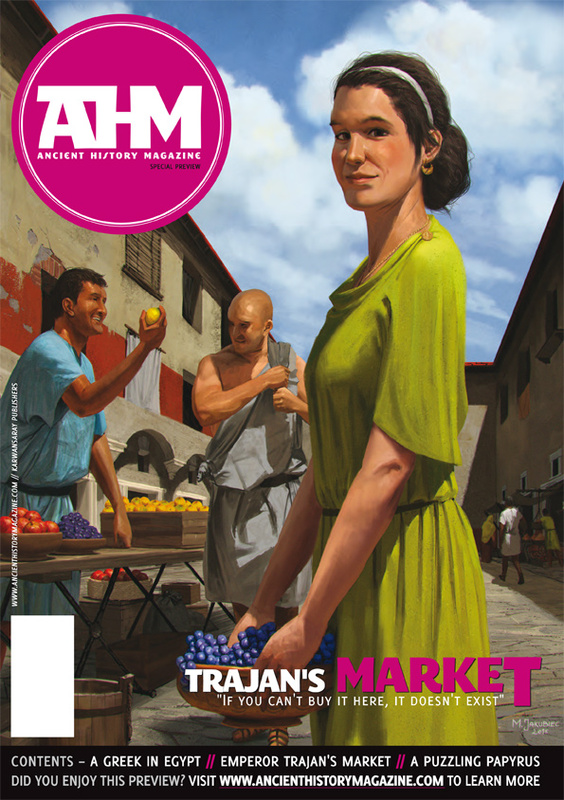 Civilis wonders whether he can restrain his warriors from claiming Roman battle trophies and accept the defeat and plunder of Roman auxiliaries and fellow Germans instead. Furthermore, for the plan to succeed, Civilis needs the rest of the Batavian cohorts now poised between returning to Batavia and continuing south with the forces of Vitellius. His choice apparently made, Civilis sends a secret messenger to the Batavians in the south asking them to ignore Vitellius and continue their march north to join their countrymen and the game of thrones begins in earnest. The grisly battle scenes, as is always the case with Riches' tales, keep you riveted to the action and guessing as to what Prince Civilis has up his sleeve. The characters are vibrantly drawn and you can't help but feel empathy for them as they desperately battle their former comrades for the continued freedom of their tribe and even life itself. 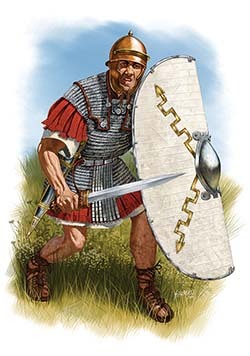 I found myself still more partial to the Batavians than the defenders of the "Old Camp" and didn't really find a new Roman centurion called Aquilius particularly appealing either due to his brutal nature. But I know such characters really crank up the tension and realism of the narrative. 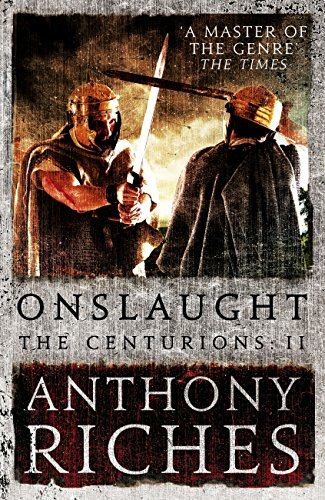 I am anxious to continue the Centurions' trilogy with "Retribution" and highly recommend this masterful series. 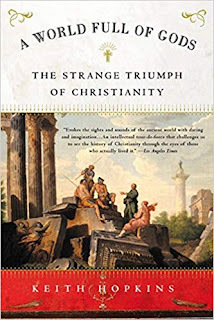 When I was researching the Roman Empire's financial crisis of the late 3rd century and subsequent embrace of Christianity as part of the solution, I found a wealth of information in the late Keith Hopkins book "A World Full of Gods: The Strange Triumph of Christianity." Before his death in 2004, I had often admired Hopkins insight shared in a number of television documentaries on the Roman Empire. Although Hopkins is mostly remembered as a professor of ancient history at Cambridge, he also served a lectureship at the London School of Economics. Since my research was going to cross over from history to economics, I was excited to find his book, originally published in 1999. But the book, like the man, was quite unconventional. Instead of a purely historic treatise on the rise of Christianity, it began with a fictional tale of time travel to first, ancient Pompeii, and then to ancient Egypt, to give the reader a taste of other competing religions during the formative years of Christianity's development. Although I was really more interested in facts than fantasy, I enjoy time travel tales so was not dissuaded from continuing to read on. Then, I came upon a very long third chapter and it was literally stuffed with the background information and sociological interpretation I was truly looking for. I marked each usable passage with purple sticky tabs and soon that portion of the text was fluttering with purple markers. Hopkins, a sociologist, drew parallels between the ancient Christian "revolution" and the political upheaval resulting in the establishment of communist China. "...in Rome as in China, the veneer of virtuous prescription disguised a multitude of sins; the church grew steadily richer, and more corrupt; Christian rigorists pursued mad ends with obsessional fervor; bishops borrowed the oppressive powers of the state to bully, exclude, and even execute doctrinal rivals. " Hopkins goes on to point out Christians viewed themselves as the fervent elect, chosen by God, and linked together by their difference from and radical rejection of others. "...once in alliance with the state, Christian leaders exploited their newfound powers in order to impose single versions of correct belief, through votes by universal councils of bishops. Almost inevitably, once its influence and power was buttressed by the state, the church also became in part a business, distributing charity, patronage, privilege, and immortality." How I interpreted this information and dozens of other passages in relation to the financial crisis of the Roman empire and the "conversion" of the Roman Emperor Constantine can be read in my paper, "Did Financial Exigency Drive The Roman Empire to Embrace Christianity?" Hopkins spends the rest of his text examining Christian literature, comparing different versions of the gospels, and evaluating Christianity's turbulent coexistence with Judaism and paganism. If you are looking for an account of purely historical events, this book, with the exception of Chapter Three, may disappoint. But, if you are open to exploring religious roots as a journey, you may find Hopkins unorthodox approach thought-provoking.